B.E.A.R.S. co-founders (from left to right) Allen Smith, William Clay, Maggie Clay, Paul Mcnutt, Jen Dempsey, and Tim Dempsey. Photo courtesy: Warrior B.E.A.R.S. Not all superheroes wear capes…some wear leather jackets. Olympia Warrior B.E.A.R.S. 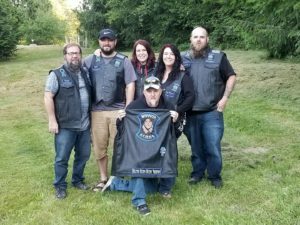 is a biker organization whose purpose and passion is to protect, support, and advocate for abused, neglected, and bullied youth and children. B.E.A.R.S. stands for Bikers Ending Abuse Repression and Shame. And, throughout Thurston and Lewis counties, they are making a difference in the lives of children and families. “Bikers aren’t bad – they’re cool!” says B.E.A.R.S. co-founder and vice president “Bad Kitty.” She and her husband, co-founder and president “Big Block,” were involved in a similar group when they lived in Texas. They decided to retire when they moved to Olympia, but the need to advocate for abused youth was one that was too strong for them to ignore. Olympia Warrior B.E.A.R.S. 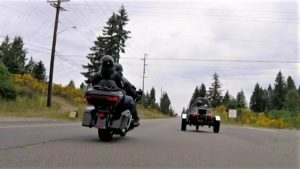 is a biker organization that combines the hobby of biking with the passion of giving back. Photo courtesy: Warrior B.E.A.R.S. Biking is a hobby of theirs, but standing in the gap and supporting the downtrodden is their passion. Here in Olympia, they found other like-minded, bike riding enthusiasts. Soon, “Pokey,” “Stubbs,” “Goat,” and “Gumby” joined them and Warrior B.E.A.R.S. was born. 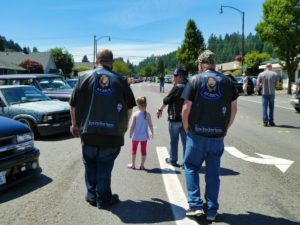 So, what does a biker have to do with advocating for children? Well, they have several ways they do this. At their core, B.E.A.R.S. wants abused children to know that they are not alone, they are protected, they have someone watching out for them, and that they are safe. They want to help victims become survivors. The big, bad biker image helps. 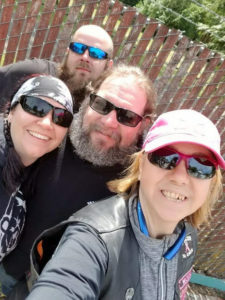 “Motorcycle groups are not bad people,” Bad Kitty explained, citing the fact that she’s been a part of groups filled with doctors, lawyers, and everybody under the sun. “But we don’t want to totally diminish the intimidating stigma,” she finished with a smile. This stigma is what helps the children feel safe and protected. B.E.A.R.S. members will accompany victims when they are in public or at school, stay outside their houses at night, and even sit through court proceedings with them. “We are here to support. We want to empower victims,” Bad Kitty said. Warrior B.E.A.R.S. Founder (left to right) Allen “Stubbs” Smith, Will “Gumby” Clay, Maggie “Pokey” Clay, Paul “Goat” McNutt, Jen “Bad Kitty” Dempsey and Tim “Big Block” Dempsey. Photo courtesy: Warrior B.E.A.R.S. When B.E.A.R.S. gets involved with a family, they go all in. When it is determined that they will be a good fit for partnering together, they “adopt” the child. This ceremony involves giving them a road name (like their members have), a vest with patches, a stuffed teddy bear filled with hugs, and an adoption certificate. These kids are now officially Warrior Cubs! The Cub is then assigned members who are responsible for being the lead contacts with the family and keeping the organization up to date on what is happening. They celebrate birthdays and other accomplishments. They attend events. “Bikers are family oriented. We support each other,” Big Block said. And that’s all too evident in the lives of these Cubs. But B.E.A.R.S. know that they can’t make a difference alone. They are also here to serve as support to teachers, schools, DSHS, CPS, law enforcement, advocacy centers, churches, and anyone else who is there to help children. They will do whatever they need to make sure victims have a voice and know they are not alone. Warrior B.E.A.R.S. out riding in the community that they love to serve. Photo courtesy: Warrior B.E.A.R.S. Take for example their upcoming Ride for The Shield Scrabble Run. On Saturday, July 14, bikers from all over will participate in this fun and beautiful ride. All proceeds from the event will go to support the Thurston County Salvation Army. Knowing how much the Salvation Army desires to meet the needs of youth in the area, B.E.A.R.S are more than honored to give to such a generous group. The funds raised will specifically go to support the Salvation Army’s Back-To-School Assistance Program. Not only are the B.E.A.R.S. raising money to help provide these school supplies for children in need, they plan on shopping with them. It all comes back to building relationships that grow into ones of trust and belonging. Bad Kitty described, “We don’t single kids out. We want them to know they are part of the family.” Their impact with these kids has been so great, they’ve had 30 and 40-year-olds telling them how they wished they had someone like this in their lives when they were kids. Word of mouth is one of the most powerful tools for the B.E.A.R.S. They want to grow in their relationships with other children’s advocacy groups in the area. This way, groups can refer children in need to them and vice versa. As well, B.E.A.R.S. has an anti-bullying program that they bring to public and private schools alike. Warrior B.E.A.R.S. spreading awareness at a local car show in Shelton. Photo courtesy: Warrior B.E.A.R.S. Community members are more than welcome to get involved. Anyone who has a passion for advocating and can pass a background check is welcome. “You don’t even have to own a bike,” Bad Kitty laughed. There are multiple options for membership. Warrior B.E.A.R.S. will have their firs public meeting on August 1. Please visit their website or Facebook page for more information or to get involved.